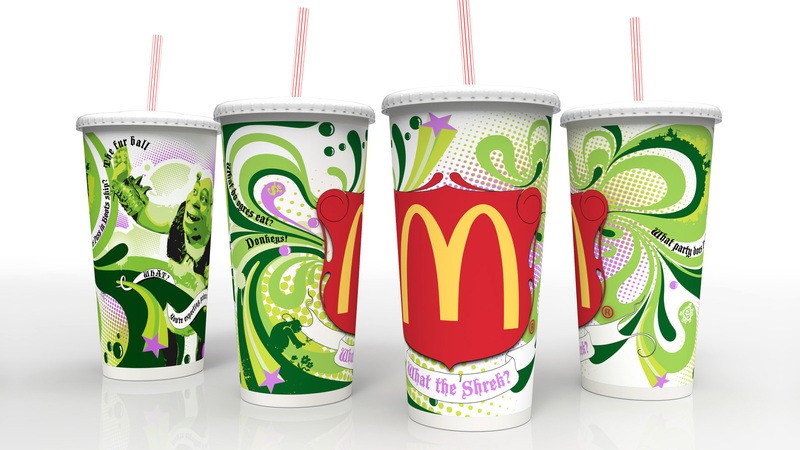 We were commissioned to create some limited edition artwork that was to promote the Shrek the third film on behalf of McDonalds and Dreamworks SKG. We were briefed to incorporate certain specific features from the film including the big green guy himself as well as the fairytale castle featured in the film. Initially we began the process by lots of sketching as is the norm for us and many of these sketches we later turned into vector work that was then styled into a flowing shape that ran around the outside of the McDonalds cups. Once again a hugely enjoyable project.